Marysville Mayor Jon Nehring delivers the State of the City address on Feb. 28 at the Marysville Opera House. we just come in and read for about two and a half hours,” she said. Students were able to pick a book and read in the gym during the school day. “I think they like the extended period of reading, they like wearing and the pajamas and they like being able to spread out on the floor and reading with friends,” said Rahkonen. “It’s really the opportunity to have a good reading time in school,” she said. Presidents Elementary students said they enjoyed the day. Presidents Elementary student Kailyn McKinney reads a book during a reading event on March 1 held for Read Across America Day. Only Mattress Factory Open Directly to the Public. FREE Custom Fitting FREE Built for your body type within 5 days! NO Retail Store Can Compare! "I played daily, in the rain and the freezing weather, and even on long summer days … spending hours chipping ball after ball," she said. She was eventually accepted into the program, one of five women accepted, and hopes to one day be involved in the golf industry or be a pro player. Natalia is also involved in community service and is on the editorial staff for her school's yearbook. At the pageant she was crowned as this year's Queen. "I was a little surprised, but definitely very excited to get this opportunity to represent Marysville," she said. She said she enjoys the Strawberry Festival because it brings all of Marysville together. "The parade is very cool to see the whole community get together in one place," she said. I was a little surprised, but definitely very excited to get this opportunity to represent Marysville. The 2019 Strawberry Festival Junior Royalty, Emma Abele, left, and Karis Lewis. of the day because I really love to help people," she said. At M-PHS she has been part of the DECA Club and was the drama club's stage crew manager for three years. She is also a part-time instructor at Kung Fu Northwest. Brionna was excited to be named as one of this year's Princesses. BUY 3 RIMS, GET 1 FREE WITH PURCHASE OF 4 TIRE SET Restrictions may apply. With coupon only. Not valid with other offers. All FREE whether you are a customer of not! BUY 3 TIRES, GET THE 4TH FREE! Veento & Hankook tires only. With coupon. Not valid with other offers. "He was opening the envelope, struggling with it, and I heard the first part of my name and I had tears welling," she said. "I went up there trying not to cry and it was just amazing." Princess Jael Hudson has been involved in ballroom dancing for many years. "I have been a competitive ballroom dancer for many years now and I have taught many people," she said. "It's given me the confidence that I have today and shown me many different people with many perspectives," she said. One day she hopes to open her own nonprofit dance studio. Jael is a member of her school's National Honor Society and volunteers at the local senior center. She is excited to take part in the Strawberry Festival. "It's such a humbling experience to be a representative of Marysville," she said. She hopes to "get new experiences and be able to meet people and interact with different people from Washington state." Junior Royalty member Emma Abele enjoys band, where she plays the clarinet, piano and ukulele, and math, where she is part of her school's Math Olympiad. "I've never been the tallest in my class, but I always try to be the nicest," she said. "I've never done anything like this or been in a festival so this is a big challenge for me," she said. Junior Royalty member Karis Lewis said she enjoys art, band and P.E. at her school. She plays the clarinet. "In my free time I play lots of sports and my favorite one is softball," she said adding she likes playing first base or second base. "Last year my sister was a Princess and she had so much fun and made so many memories," said Karis, so she is looking forward to this summer. staff at some schools made some of the food green. “All of our elementary schools are doing something,” said Gary Sabol, director of communications at the Arlington School District. “Reading is a big focus for our schools so we’re really just emphasizing that this week,” he said. Get the Shower Door You Really Want! Hundreds of design, color and glass combinations. Any time you are buying or selling with a stranger there's always an element of risk, so this really helps people feel a lot more comfortable. base of community meeting spots that are in front of law enforcement agencies. Arlington isn’t uploaded to the site yet, but should be added soon said Banfield. Other jurisdictions like Marysville are already on the site. “We’re a little late to the party on this one, but we’re happy to have it up now,” she said. The signs for the designated safe meeting spaces in front of the Arlington Police Station. Tomahawks’ junior point guard Luke Dobler goes along the baseline and kicks out for the three against the Kelso Hilanders at the Tacoma Dome on March 2. RaeQuan Battle, Tomahawks’ senior wing, uses the step back and hits the deep three with a Kelso defender in his face at the Tacoma Dome on March 2. Match begins at 3:30 p.m.
Games begin at 4 p.m.
Game begins at 4 p.m.
March 9	M-PHS Jamboree	March 12	Sedro-Woolley	*Game begins at 10 a.m.
March 9	M-PHS Jamboree	March 11	Arlington	March 12	Stanwood	*Game begins at 10 a.m.
March 9	M-PHS Jamboree	March 11	Monroe	March 12	Sehome	*Game begins at 10 a.m.
March 7	Jamboree	March 12	Mount Vernon	*Match begins at 6 p.m. Match begins at 7:30 p.m.
Meet begins at 2 p.m.
Games begin at 4:30 p.m.
March 7	Jamboree	Home	LWHS March 9	North Mason	Home	LWHS* March 11	Granite Falls	Home	LWHS** *Game begins at 1 p.m. **Game begins at 7 p.m. Match begins at 5 p.m.
March 9	Jamboree	March 12	Granite Falls	*Match begins at 10 a.m.
Matches begin at 3:30 p.m.
March 9	M-PHS Jamboree	March 11	Lakewood	*Game begins at 10 a.m.
For more info, visit www.wescoathletics.com or www.cascadeathletics.com. BTC Tire Center Bud Barton Glass Bundy Carpets Burger King of Marysville C Don Filer Insurance Cascade Veterinary Center Chinook Lumber Arlington CLC Licensing Community Health Center Country Burger Cuz Concrete Defensive Driving School Dr. Scott Stayner E & E Lumber East Valley Sand & Gravel Edward Jones Gregory Jensen Edward Jones Loren Van Loo Flowers by George Four Day Fireplace Gary & Donna Wright RE Prop. Mgmt. Sierra Scheppele, Arlington’s junior guard, uses her crossover as he moves the Wildcats defense and looks for the pass into the paint at the Tacoma Dome on Feb. 27.
have grown up around these guys ever since I was little, they are my brothers. Playing for my coaches and with my teammates is something I’m going to miss, but I’m excited to go out and prove myself at the next level,” said Tomahawks’ star wing and University of Washington commit RaeQuan Battle. Mar ysv i l le-Pi lchuck played in two games in the State Tournament leading up to the battle against Kelso. On Feb. 28 the Tomahawks lost to the O’Dea Fighting Irish, 63-53, but came back and dominated the next round with a win against the Ingraham Rams, 80-68, on March 1. The Tomahawks had some impressive tournament totals from their core starters Battle, Dobler, Stordahl and Kalab. Battle totaled 68 points, 26 rebounds, seven assists, six blocks and three steals. Dobler tallied 38 points, 23 rebounds, 13 assists and eight steals. Stordahl had 42 points, 11 rebounds, three assists and three steals. Building A Bond For Life. Arlington’s freshman guard Keira Marsh uses her speed to push the ball up the court against the Wildcats at the Tacoma Dome on Feb. 27. ton with 13 points as she hit 9 of 10 from the free throw line, grabbed seven rebounds, four assists and one steal. Schwark, forward, scored five points while dishing one assist and leading the team in rebounds with eight. Arlington’s freshman point guard Keira Marsh had a great game coming off the bench. Marsh scored the thirdmost on the team with eight points, grabbed two boards and took two steals in the second half. With this final game of the season, Arlington finished with an overall record of 17-7 and a league record of 12-1. With only two seniors on their varsity roster and their entire starting lineup returning next season, the Eagles will look to reload and make a run in the tournament next year. their varsity roster. Behind a strong core and another year of experience the Tomahawks will look to threepeat as District Champions and make a run at a State Title. Ramona is an active and intelligent young dog who needs some work on manners. She has learned ‘sit’ and is very food motivated which will be helpful for learning new skills. She’s a very smart girl brimming with energy who would greatly benefit from plenty of physical and mental stimulation at home. Ramona would do best in a home with an adult dog who will show her the ropes. She has done well with confident kids and will need a home with NO CATS! Kids 8+. Ramona weighs 57 lbs. mother,’” said Vesely. The program provides education and training and “knowing how to react in every situation as a caregiver,” said Vesely. There are state services and caregiver support groups all across the county that can help caregivers. “They tell their stories that everyone there can understand,” she said. The classes can also help caregivers connect with resources to learn more about diseases like Alzheimer’s. Topics of the program include how to handle stress and “looking for the early warning signs of stress” and “how to communicate … sometimes they don’t want to talk about the problems,” said Vesely. The caregiver program is paid for by the federal government to help provide support for caregivers across the country. To learn more about the program or to register contact Angeles Vesely at avesely@stillycenter.org or Debbie Cook at dcook@stillycenter.org. change the Marysville Fire District from a contracted service to different structure. “That’s really something that needs to happen to properly finance and manage our fire services,” said Nehring. “Most cities and entities are going to Regional Fire Authorities,” he added. Expanding street infrastructure and jobs over the next few years is also important for the city, said Nehring. “We know a lot of people with jobs are moving here and commuting, so we’ve got to provide local jobs and road infrastructure,” he said. The Arlington-Marysville Manufacturing Industrial Center near Smokey Point is close to getting an official manufacturing industrial center designation, said Nehring. “There’s only a handful throughout the Puget Sound … there’s a lot of resistance in Seattle and Tacoma who control most of them and they don’t want to designate another area so it would be a big deal,” said Nehring. The designation would help bring attention and potentially money for infrastructure to the area. That area has been saved by the Marysville City Council for a while in the hopes of attracting manufacturing jobs. “We’ve had a lot of developers come in and want to turn this area into housing and we said ‘no, we have enough areas for housing and we need to preserve some area for a jobs base,’” said Nehring. Upcoming street projects include a new interchange in south Marysville at SR529 and I-5 and the design work for a over-crossing that would go above the trains at Grove Street. An over-crossing at other places is not feasible due to the amount of property the city would have to buy, said Nehring. “At Grove we don’t have to buy up any properties and would drop you right off by the Community Transit Park and Ride,” he said. This is the second year that Nehring has delivered his State of the City to the public at the Marysville Opera House in addition to the Marysville Tulalip Chamber of Commerce. In past years he only gave the address at the chamber. Share your news! Help us tell your neighbors about club activities, fundraising events, meeting schedules and more. 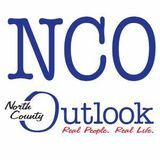 Send your information to North County Outlook, P.O. Box 39, Marysville, WA 98270 or e-mail the information to: editor@northcountyoutlook.com. Many people are using the Keto Diet to lose weight. ness located at 2639 172nd St. NE Suite 104 in Smokey Point/Marysville. She can be reached online at www. idealwellnesswa.com or info@idealwellnesswa.com. With Daylight Saving Time and spring just around the corner, we’re excited to step up our activity levels and embrace all the health and wellness activities the Marysville Tulalip community has to offer. Here’s just a sample. City of Marysville Dozens of city parks and some amazing trails for walking and biking offer a range of free outdoor experiences with something for everyone. We’re excited this year to connect Bayview Trail to Centennial Trail and build a new Olympic View Park in south Sunnyside connecting to the Ebey Waterfront Trail. The city also offers many affordable sports, fitness and wellness classes and activities for all ages and abilities. A quick look shows you can sign up for an adult softball league, take a CPR/First Aid class, learn self-defense, practice tai chi/yoga/Zumba and get a massage! Review the many options and sign up for the one that’s right for you at https://apm.activecommunities.com/marysvillewa/Activity_Search. And it’s not too early to plan ahead and mark your calendars for fun outdoor activities coming this spring. Among them are the Kids’ Fishing Derby at Jennings Park on May 4 and Healthy Communities Challenge Day on June 1. Look for more information coming soon. Marysville School District We like to remind our students and families that keeping a healthy body helps to create a healthy mind. Many important factors play into this: n Adequate sleep: children need at least 10-12 hours of sleep per night for healthy brain development. n Schedule/routine: regular bedtimes and wake times and predictable schedules help to instill a sense of security. n Proper nutrition: a blend of fresh fruit and vegetables, along with adequate protein, carbohydrates and hydration are important to healthy body and mind development. n Reduced screen time: research is showing that too much screen time may negatively impact a child’s developing brain. n Social, emotional, mental health: know who your child’s friends are and where they spend their time, monitor social media accounts, and talk together on a regular basis such during family dinner time. n Health and wellness check-ups: regular health and dental check-ups are an important part of your child’s overall health and well-being. n Outdoor activities/fresh air: increased outside play and activities on a regular basis improves overall health and mental wellness. Our Favorite Quotes "The longer I live, the more I read, the more patiently I think, and the more anxiously I inquire, the less I seem to know ... Do justly. Love Mercy. Walk humbly. This is enough." Author ­— John Adams Submitted by North County Outlook editor Scott Frank. Marysville Mayor Jon Nehring, Tulalip Tribes Chairwoman Marie Zackuse and Marysville School District Superintendent Jason Thompson. The Marysville and Tulalip community offers many opportunities that support healthy choices. We invite you to challenge yourselves and family members to embrace the beauty of our local community and get moving! Tulalip Tribes The Karen I. Fryberg Tulalip Health Clinic has a new website with many wonderful resources for health and wellness to better yourself mentally, physically and spiritually. One of the award-recognized programs is the Diabetes Care and Prevention Program, which received the 2016 Indian Health Service Portland Area Director’s Award Recognition of Excellence. Every Thursday this month from March 7 through March 28, from 4:30 to 6 p.m., Miguel Arteaga (RN) and Natasha LeVee (PharmaD) will provide information about living a positive life with diabetes and participants share a light meal. If interested, join us at the Karen I. Fryberg Conference Room at the Health Clinic. For more information contact Veronica Leahy, Diabetes Program Coordinator, at 360-716-5642 or Brooke Morrison, Program Administrative Assistant, at 360-716-5617, or go to https://www.tulaliphealthsystem.com/ At the Hibulb Cultural Center every 2nd Thursday of the month, from 5:30 to 7:30 p.m., a Suicide Survivor Support Group meets. Because wellness is directly connected to mental health, please note the 24-Hour Crisis Line provided by Volunteers of America, 1-800-584-3578. You can also get more information and use the chat services at www.imhurting.org. This monthly column is jointly prepared by the City of Marysville, Marysville School District and Tulalip Tribes about topics of interest to the Marysville Tulalip community. Weekly Puzzles Fun by the Numbers Sudoku puzzles are formatted as a 9x9 grid, broken down into nine 3x3 boxes. To solve a sudoku, the numbers 1 through 9 must fill each row, column and box. Each number can appear only once in each row, column and box. You can figure out the order in which the numbers will appear by using the numeric clues already provided in the boxes. 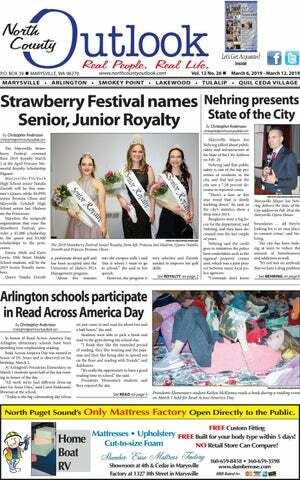 See answers on page 10 .
alty Scholarship Pageant. These wonderful young ladies can look forward to representing our community for the coming year. Thank you to all those who participated, and thank you to those who put on the festival. RAVE: Don't forget to 'Spring Forward' one hour on March 10 as Daylight Saving Time begins. It's also a good time to check the batteries in the smoke detectors in your home. Publisher/Sales Manager .............................. Sue Stevenson Editor .................................................................... Scott Frank Real People. Real Life. Staff Writers ..................................Christopher Andersson, Sarah Arney, Andrew Hines North County Outlook is published every Wednesday Display Ad Sales ..............Terrie McClay, Carole Estenson and mailed direct to households and businesses Directory Ad Sales ............................................. Barry Davis in Marysville, Arlington, Smokey Point, Tulalip and Graphic Design ..............Christina Poisal, Nathan Whalen Quil Ceda Village. Letters to the editor, community Office Manager/Billing ................. Leah Hughes-Anderson news and story ideas may be e-mailed to editor@ northcountyoutlook.com, or sent to the mailing address Contributing Writers ........................................Steve Smith, above. The Publisher reserves the right to edit material The Tulalip Chefs, Penny Davis for content, grammar, taste, style or length, and all submitted items are published at the sole discretion of the Publisher. Arlington Public Schools is accepting Highly Capable Program referrals for kindergarten through 11thgrade students through Friday, March 29. Students will be considered for evaluation for possible program participation for the 2019-20 school year. Students who are highly capable may possess, but are not limited to, the following learning characteristics: n Capacity to learn with unusual depth of understanding, to retain what has been learned, and to transfer learning to new situations; n Capacity and willingness to deal with increasing levels of abstraction and complexity earlier than their chronological peers; n Creative ability to make unusual connections among ideas and concepts; n Ability to learn quickly in their area(s) of intellectual strength; and n Capacity for intense concentration and/or focus. Referral forms are on the district website and may be returned to Heather Brown, Teaching and Learning, 315 N. French St., Arlington, WA 98223. Protect your income. Contact us and see what an independent agent can do for you. Advertise Your Message Here for as Little as $25 per Insertion! of $250 will be awarded at the end of the auction. Proceeds from the auction is used to put on the oneday youth fair and provides ribbons, trophies and premiums to the youth of the area. Auctioneers this year is Dave Fenton from Leavenworth & George Magnochi from Carnation. If you have a new item to donate to the auction, call 360-6528682. Friends of the Arlington Library Book Sale: Great books available at bargain prices. Something for everyone! Mar. 's theme is gardening. Proceeds support the Arlington Library. Held Tuesday, March 12, 9 a.m. to 3 p.m., and Wednesday, March 13, 10 a.m. to 2 p.m., at the Arlington Library, 135 N. Washington Ave. Arlington Book Discussion Group: Come join us for a discussion of George Hodgman's "Bettyville," a warm account of his becoming caregiver for his strong-willed nonagenarian mother. held Tuesday, March 12, beginning at 6:30 p.m., at the Arlington Library, 135 N. Washington Ave.
COMING EVENTS Soil Science and Plant Nutrition - With the WSU Master Gardeners: Learn soil and compost tips from the WSU Master Gardeners. held Wednesday, March 13 beginning at 5 p.m., at the Arlington Library, 135 N. Washington Ave. Grant Writing Workshops: Grant Writing Workshops will be held Thursdays, March 14 & 28, beginning at 2 p.m., at the Marysville Library, 6120 Grove St. This two-part grant writing workshop helps you perfect your ability to craft proposals that effectively and successfully deliver your organization’s message to potential funders. Session One: Crafting Proposals That Pack a Punch (March 14) Session Two: From Budgets to Attachments, Character Counts, and Balancing Stats with Stories (March 28). Presented by Debra Jensen, a Seattle area nonprofit consultant and freelance grant writer. Please preregister as space is limited. For more information call 360-6585000 Class of 1979 Reunion: Marysville Pilchuck High School Class of 1979 40year reunion will be held July 27, 2019, at the Marysville Opera House, 3-10 p.m. and will include dinner and fun. RSVP required by 4/28/2019. Cost is $65 per person. For ticket and more information email classof79-40@hotmail.com. Classified: Events/Festivals PROMOTE YOUR REGIONAL EVENT statewide with a $325 classified listing or $1,575 for a display ad. Call this newspaper or 360-344-2938 for details. A PLACE FOR MOM has helped over a million families find senior living. Our trusted, local advisors help find solutions to your unique needs at no cost to you. Call 855-4154148.
altar server since 2014, including being head altar server since 2015, where she leads and works with about 30 servers. Academically she is also interested in photography and videography and runs her own YouTube channel. Walker Braillard has been involved in student leadership at Getchell for many years as well. Even before officially being part of the ASB there he had put in many hours in the 2017-18 school year helping putting on school events with them. In his junior year he took over the role of ASB Technician. This year he has put in more than 75 hours to help support the events that go on at the school. For the past four years he has also been a part of Getchell’s tennis team. Walker won the Most Inspirational award last year and also made it to subdistricts at the end of last season. Since 2017 he has also been the Getchell girls tennis manager, and plans to return for a third year as manager this spring. “The team in the last two years has had over 30 girls, proving to be a difficult but incredibly fun learning experience,” he wrote. He also spent one and a half years as part of the FBLA Club at the school. During four car washes Walker and his peers helped raise more than $700 for the club, and he participated in the 2016 Winter Bazaar. He placed second in parliamentary procedures, both at the regional conference and the state conference. Whether you’re celebrating a wedding, baby’s first birthday, or a milestone 75+ birthday, share your joy with our readers! ARE YOU BEHIND $10k OR MORE ON YOUR TAXES? Stop wage & bank levies, liens & audits, unfiled tax returns, payroll issues, & resolve tax debt FAST. Call 866-494-2178. DONATE YOUR CAR TO CHARITY. Receive maximum value of write off for your taxes. Running or not! All conditions accepted. Free pickup. Call for details, 855-635-4229. There’s no fee for publication - it’s FREE. Celebrate that! Call Barry at 360-659-1100 to include your services in this directory for as little as $50 per month! leaves. Best of all, the new introductions don’t bloom as much, so you don’t have to pinch them all the time. From Proven Winners is my newest favorite called Colorblaze ‘Golden Dreams’. It sports colorful chartreuse foliage with red veins and will be a must in most of my containers this summer. Truly, this is just the tip of the iceberg. I will share many more new plants in the next few weeks, so you can be on the hunt once spring breaks. Steve Smith is the owner of Sunnyside Nursery in Marysville and can be reached at info@sunnysidenursery.net. Justina Thompson, right, receives an award on Feb. 28 from Rotary member Daryn Bundy for her volunteer work at NOAH Animal Shelter. ing to organize parades and help attendees. “They do the Torchlight parade and many others like the Strawberry Festival parade,” said Raechel. “I help them getting everybody situated." She enjoys being able to support many of the local festivals that the SeaFair Marhsals volunteer at. “I just love helping them out and it actually makes it so there is more volunteers there to help with the parades,” she said.